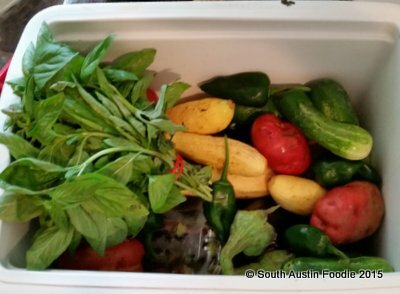 Johnson's Backyard Garden is one of the largest Austin-area farms and providers of CSA boxes in Austin. What's a CSA? Community Supported Agriculture -- you can read more about it on Johnson's page -- but basically, you pay into a local farm for a share of the produce that comes out of it. The farm will pack a variety of their seasonal items literally into a box and subscribers pick them up from a pre-established location or they are delivered right to your doorstep. Prices start at $21 and go up from there; you determine the size of the box and the frequency in which you want it. They were kind enough to offer me a box free of charge. All opinions are my own, and I was not financially compensated. What comes in the box? Well, of course that will depend on the season! Johnson's has stuff growing 365 days out of the year, so even if you were only going to get a box occasionally from them, there would be a ton of variety! 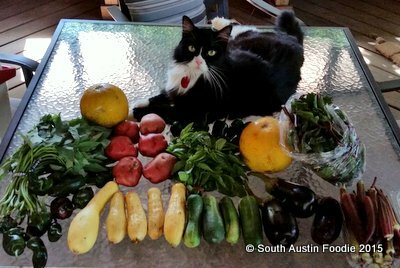 Have you ever been to one of the Austin-area farmers markets and seen a HUGE booth with just about everything that could be in season? 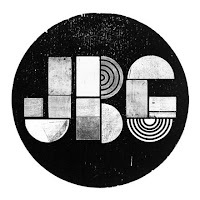 Yeah, that's JBG, and they're at 20 different markets now! Anyway, if you're a CSA box subscriber, you can always go to their website for a description of what's in that current week's box. I left a cooler on my front porch, so this was my first glimpse of my produce treasures! From left to right, we had sweet potato greens, poblano peppers, cantaloupes, red potatoes, yellow squash, basil, cucumbers, eggplant, malabar spinach (in the bag) and okra. For a small household, it's a lot of produce! I have to admit, unless it's fried, I am not a big fan of okra, so I gave it to a friend who loves it. And I still haven't used the malabar spinach; it seems very hardy, and in fact isn't even a spinach! But here's a look at what I've been cooking for dinner. The sweet potato greens were a new one for me. I looked online for some recipe ideas, and via Prevention magazine, actually found a recipe from local blogger MJ and the Hungryman! So I made my version of their sauteed sweet potato greens: heated a equal combination of grapeseed oil (neutral flavor) with sesame oil (great flavor, but low smoke point) in a skillet, and added some fresh grated ginger and a little garlic to taste. I added the greens, and just cooked them for about 2 - 3 minutes so they wilted down. 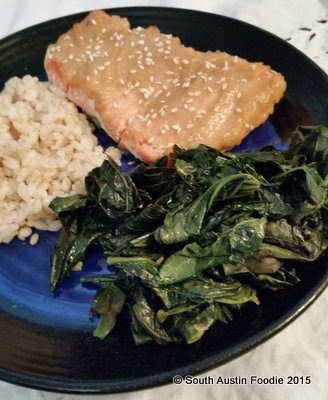 I made a complete meal with some miso-glazed wild salmon and brown rice. I really liked the greens (I was surprised! ); they were a lot like cooked spinach with a little bit more of a bite to them, kind of like arugula. I had some leftover and took them to work for lunch the next day; unfortunately, they were much more bitter the second day. With the poblano peppers and basil, I made pesto. I lightly charred the peppers over the open flame of my gas stove, sealed them in a plastic bag to steam, and then peeled the skins off. I cut the stems off, de-seeded them and put them in a food processor with the basil and pumpkin seeds, some Parmesan cheese, and then drizzled olive oil in. It's got a nice little kick! Pesto is one of those versatile things that can be made a million ways depending on your preferences; it doesn't have to just be basil. 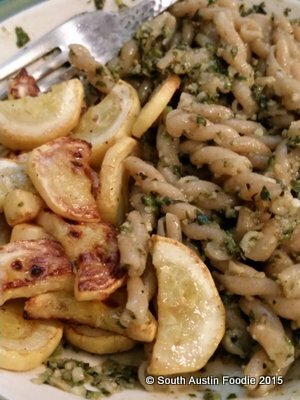 While I do like pesto pasta, as seen below with sauteed yellow squash from the box, I LOVE using pesto as a base on a pizza instead of red sauce. Smear it over your crust, add a little prosciutto, some good fresh mozzarella, and maybe a touch of olive oil on top. Bake it around 425 degrees for about 10 minutes, so the cheese is getting bubbly and a bit golden. 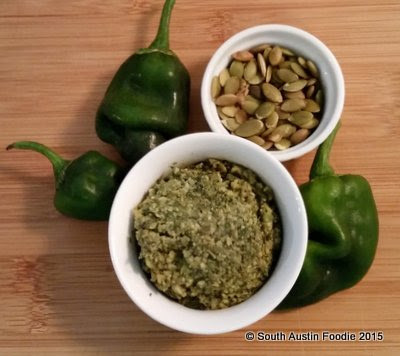 Great for an appetizer or main dish. Pesto also freezes fairly well. You can freeze in small batches (ice cube trays or just plop by the spoonful or quarter-cupful on plastic wrap, wrap well, and put in a zippered bag) so you can then pull out just what you need. I love different types of Asian food, and a Thai curry stir fry is one of my go-to dishes. You can vary the protein: tofu cubes, pork or beef strips are my favorites, and of course lots of different vegetables. I had lots of eggplant and yellow squash from Johnson's, and I added red bell pepper and baby bok choy. In a wok or large skillet, I heated some grapeseed oil and a splash of sesame oil; for this one, I used beef that was already cut into stir fry strips by the butchers at Central Market (it's very handy). I cooked them for about 2 minutes to take the pink off the outside, and removed them from the pan; they'll get cooked all the way through later. In the same wok, I added a touch more oil, and added my cut up vegetables, saving the bok choy for last because it takes less time to cook. Push the vegetables up the sides of the wok; add about a quarter cup of well-shaken canned coconut milk and then about 2 tablespoons (or more if you like it spicy!) of the panang curry paste. Work the paste into the coconut milk to dissolve, gradually adding more coconut milk, and finally adding the entire 15 oz. can. 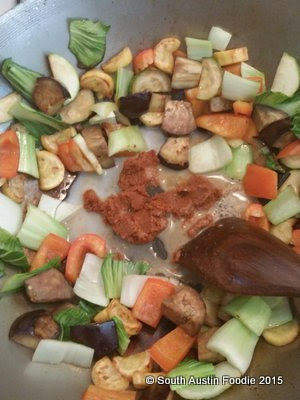 Incorporate the veggies into the sauce, and let simmer about 5 minutes, adding the protein back for the last two minutes (can get tough if over-cooked). Check for seasoning; I usually add a couple tablespoons of fish sauce, lime juice, and brown sugar (or palm sugar if you have it) to round out the flavors, and my Thai friend has complimented my panang rendition! Serve over rice of choice (white jasmine would be the traditional Thai choice, but basmati, Texmati or even brown are fine -- you're in control!). 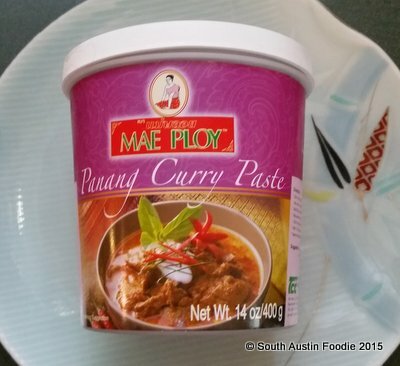 I am partial to the Mae Ploy brand of curry pastes, as my Thai friends have recommended them. Central Market carries the red, green, and yellow, but the Asian groceries like MT Market up at the Chinatown complex on North Lamar and Braker has the panang. Yes, these curries are all different and are nothing like Indian curry! 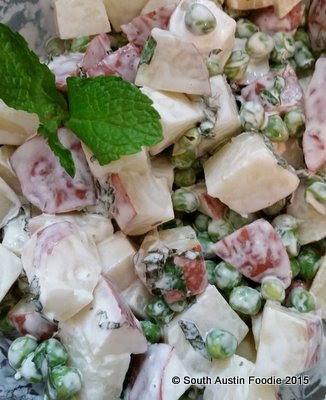 Potato and pea mint salad is a recipe that my mom used to make. Cube/large dice (your choice on size, just so they are mostly uniform so they will cook evenly) about a pound and a half of red potatoes (I used three small fist-sized ones), and either boil or steam them until tender. Drain, rinse with cold water, and toss with 1 - 2 tablespoons white vinegar to keep from sticking as they cool down. Blanch about a cup of green peas until just cooked, and drain and rinse in cold water. Toss with the potatoes. Add 2 - 3 tablespoons of fresh chopped mint. In a small bowl, combine about 1/3 cup mayonnaise with 2 tablespoons vinegar, and salt and pepper to taste. Add to potato mixture, combine well, and refrigerate for at least an hour so flavors can meld. Like Mom used to make! All the variety, year-round abundance, and multiple outlets from CSA deliveries to farmers market stands give Johnson's Backyard Garden a huge presence in Austin and the surrounding areas. I imagine they will be here for years to come, which is awesome. And if you really want to know where your food comes from, they take volunteers to help out in exchange for a bit of produce. Though for now, it's time to figure out that malabar spinach.... any suggestions? You did really good using up those produce and also inspired me to be better about veggies.